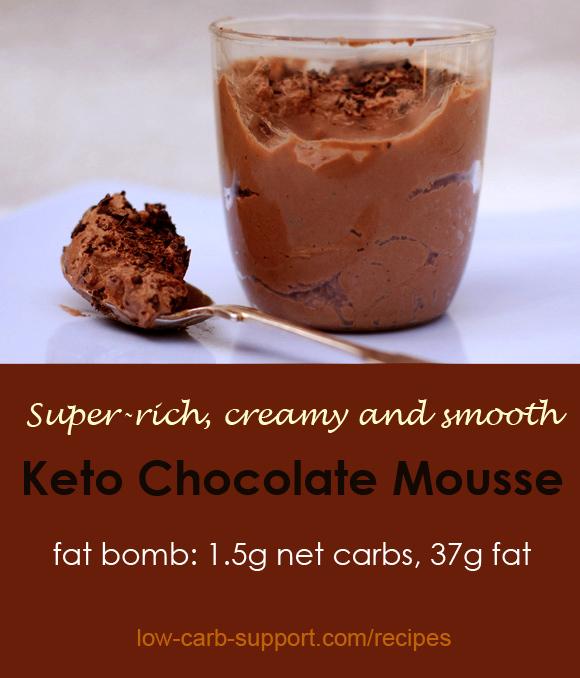 This Keto chocolate mousse recipe is basically a chocolate-flavoured fat bomb. Super-easy to make, with only a few simple ingredients required. You can eat it on its own as a really decadent dessert, or use as a filling for cakes. It is very rich and filling, so you only need to a little bit to satisfy even very strong chocolate cravings! I use Green & Black unsweetened cocoa powder in my recipes – I think it’s the best option if you are in the UK. 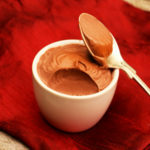 In the USA, good brands for high-quality unsweetened cocoa powder are Valrhona and Ghirardelli. If you use a different brand, just make sure it doesn’t have any added sugar. I recommend using a granulated sweetener, like Truvia or Swerve. Liquid sweetener drops can work too, but some people reported problems with texture and bitter taste when using drops. If you have the time, stick it in the fridge for 30 mins or so - it will taste even nicer. As mentioned, this is a bit of a fat bomb! Do you need more Keto dessert recipes? Carolyn Ketchum is the ultimate guru of low-carb and Keto desserts! 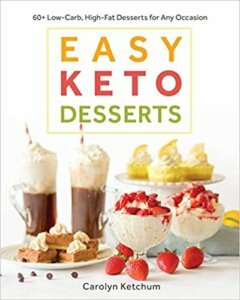 Check out her latest book Easy Keto Desserts on Amazon for great recipes to satisfy those sweet cravings – without compromising your Keto diet! This Keto Chocolate Mousse recipe was first posted in 2013. Since then, I received hundreds of comments from people who tried it, as well as amazing variation ideas. I selected my favourites below, and you can also scroll down to the end of the page to read all comments. Lovely MandaPanda made a YouTube video of this recipe – check it out! Hi, I just made this and it was delicious! But the amount seemed so small and I doubled it. All of it didn’t even fill up a basic mason jar. Am I doing something wrong? It seems like a serving would be like 3 tablespoons with the amount it ended up making. How well and long will this keep in the fridge? I would say up to 3-4 days – but it usually gets eaten much faster than that! I never write reviews because I don’t particularly care, but this recipe was surprisingly delicious. I just started the keto diet, and I needed a small “snack” to add enough fat to my daily macros. This added just enough, and who would of thought that I would be able to eat chocolate mousse while on keto! Next time I make it, I will have to leave out the sweetner, I found it too be too sweet for my tastebuds. But delicious anyway! Can’t wait to try to vanilla version you posted. Oh my goodness how delicious this is!!! Thank you for the best keto dessert recipe I have ever tasted!!!! Made this today. It’s so good! Definitely will be making this regularly! I used confectioners swerve. Delicious!!! Thank you Brenda! I am so glad you enjoyed it. I have never tried Confectioners Swerve – is it any different to their standard sweetener product? Oh my gosh I think this is the best recipe for dessert I have ever had while Keto. I doubled the recipe. What I did was what many did, add vanilla, I added my sweetenerto taste and I used purevia, went a little less on the butter and more on the cream cheese. I think brands of cream cheese make a difference too, I did use a major brand. Right now it’s in the refrigerator cooling and I’ll have it as soon as my husband gets home. As far as blending I did use a hand mixer and everything was room-temperature. I didn’t put anything in the microwave. Whipped up beautiful. I’m sharing this on my Facebook groups that I have for keto. Thank you thank you. I just want to mention the next day, I added some all natural peanut butter with no sugar added type and it was to die for. it now tastes like a Reese’s which I love but will not eat because it’s not keto and it’s for chemicals so now thankfully I have this recipe. I am addicted to this. Thanks again, Diana – PB addition sounds fantastic! But I do agree, best to be cautious with it when on Keto. Best of luck with your diet! We love this – we add PB2 to this and it’s tastes AMAZING (although PB2 isnt completely Keto so make sure you read about it first- but we are doing a low sugar diet and not completely Keto). For folks that say it’s not working for them- try slightly heating up the cream cheese before blending it. If you get it straight from the fridge we find that it clumps. Also, you can play around with reducing the amount of cream cheese for a fluffier variation. Mmm, PB does sound good! I think it’s possible to fit a little bit of PB into Keto – provided it’s a sugar-free version. Thanks for sharing your tip! I’m going to try making this, not sure what double whipped cream is? Also, dairy and I are not friendly, i was thinking of using coconut cream. I have read through DOZENS of responses and didn’t see that anyone tried that… thoughts? Hi Kim, double cream is the same as heavy cream in the USA. Whipped just means you have to whip it before adding to the recipe. I don’t know of anyone who tried coconut cream, but I think it should work. Fat content and consistency are fairly similar to dairy cream. Please let us know how it turns out. Best of luck! First menstrual period doing Keto and the chocolate cravings are INTENSE. Made this tonight and it hit the spot—thank you! I think next time I’ll decrease the butter and add more cream just for my taste preferences, but otherwise the texture and taste was great. Thank you again! Thank you Mandy! I am glad you enjoyed it. Best of luck with your diet! Thank you Laura 🙂 I am so glad you enjoyed it! Best of luck with your Keto diet. Just made this tonight, and it was totally yummy and satisfied my chocolate craving! I did have to thin out the chocolate mix (before adding the whipped cream mix) with a bit of heavy cream and almond milk to keep it from clinging to the beaters. But overall, it was pretty simple and definitely a keeper! Thanks! Delicious! Easy to make. Can’t thank you enough for this recipe. Thanks for the feedback, Carol. I am so glad you enjoyed the recipe 🙂 Best of luck with your diet! I followed the recipe exactly. Mine was a very pale chocolate, nothing like your picture of dark chocolate. The texture is more of a fat bomb, not light like a mousse. I am sorry you were disappointed, Jeannie. Which brand of cocoa did you use? I dont like lardy treats so i skipped the butter and the cream and it was amazing. I added homemade raw butter, extra cocoa powder and 2T honey. Came out perfect. Great, thanks for sharing Katie. Just to point out though, most people who visit this website are on a low-carb diet – so honey wouldn’t be a suitable ingredient (too high in carbs). But if you are on Paleo or a similar plan, then honey is great! Great! Best of luck with your diet. Just made some, very good! I doubled it, little less butter and a little more cream cheese, as well as some vanilla extract. Perfect! Fantastic! Thanks for sharing your feedback and tips. Yea…Mine didn’t come out to well either. I think it might have helped for people new to mousse know that the chocolate mix and whipped cream should be the same temperature. Otherwise you’ll come out with a wet, chunky and very unappetizing disaster. Hopefully chilling the whole thing and reshipping will help save it. I’m doubtful. Hi, I am very sorry to hear it didn’t turn out well for you. I didn’t think that the difference in temperature would be that crucial, but I will try to experiment and check this. Did it get any better after you chilled it? Fantastic for my sweet tooth craving! Thank you!! Modified with a little less butter and a little more cream cgeese (flavor referance) and whipped up in smoothie blender. Easy and satisfied my sweet tooth. Thank you for sharing!! Thank you 🙂 Very glad you enjoyed it. Thank you so much for this recipe! I’m new to Keto, and so far have been doing “total carbs” as opposed to “net carbs”… I was wondering if you could give me the total carbs of this recipe? I’m still not sure of the formula to figure it out… Looks amazing and can’t wait to try it! Hi Elaine, when you say total carbs, do you mean “total carbs” as opposed to “net carbs”? The figures I provided were net carbs. Also, which brands did you use for cream cheese and cocoa powder? My count is based on using full-fat Philadelphia cream cheese and Green & Black sugar-free cocoa powder. Other brands may have slightly different carb counts. Thanks, I needed total carbs too, as I have non functioning beta cell insulin dependent body. Was very excited to make it, especially after reading a lot of the reviews. Simple to make and the GROSEST thing ever! Oh dear! I am sorry to hear that. Did you make any changes or substitutions? Thanks for the recipe. I made this for a friend on a ketosis diet who was looking for some dessert options. I usually do mousse the old school Julia Child’s way – so much work and so bad for you 🙂 but so tasty. I was pleasantly surprised at how much I enjoyed the portion I ate. I used standard nestle unsweetened baking cocoa, a vanilla flavoured liquid Splenda sweetener, salted butter and thickened cream. (All I had in the fridge at the time) and it was awesome. So good that I have shared the link with a family member straightaway. I’ll keep JC’s fancy mousse up my sleeve for special occasions, but this one is a total winner and since it took me about 4 mins total to make, will become a good go to last minute dessert if I need to knock something up – or have a sweet craving. Thankyou again. Since I’m not personally watching a diet like this, I’m open to interpretation lol, so I’m going to try it again tomorrow but use a 1/8 cup of muscovado sugar. I like that this is not overly sweet and I think muscovado sugar would be brilliant. Definitely would need longer beating and longer chilling to help smooth out the sugar grains – but that’s ok. Thankyou again! Thank you so much for taking the time to write such a nice and detailed comment! It’s great to hear the recipe works for non-keto people too. I am sure it will turn out lovely with sugar. The only point to note that it will further increase the calorie count – which is already quite high. Thank you again and good luck! For me the melted butter didn’t mix well with the other ingredients… am I doing something wrong? Hi, the butter is supposed to be softened at room temperature rather than completely melted. Omg thank you. THaNK YOU!!! This so hits the spot. I did 1 oz butter and 3oz cream cheese and added a dollop of sour cream and it is sooooo good. Ive had a scoop (or 2 *whistles innocently*) every night and still losing 1lb a day! This has saved me from cheating!!!! Thank you Les 🙂 I am so glad you liked it! Great tip about sour cream, thank you for sharing. Good tip, thank you for sharing. The only thing is, sour cream has fewer carbs and a lot more fat than Greek yoghurt. So that makes it better for people who are on Keto/LCHF diets. Not so sure I did this right. I tried to convert to Tbsp. etc but mine ended up tasting too much like a giant bowl of butter. I doubled the recipe and did 4 TBSPs of butter and 6 oz of cream cheese and 1 tbsp if sour cream and it was perfect if you want to try that! Not too buttery at all and so delicious! Pretty good. I wish I had read comments before making it. As others commented, my tastes would prefer less butter and a little more chocolate and Swerve. As recipe states, it is MUCH better after chilling. Thank you for posting recipe. I like that it’s a small batch and easy to attain ingredients. I’m back! Today I dropped one of these in a cup of coffee and pulsed in blender. OMG!!!! Mocha Cappuccino!!! It was amazing!!! I added a little more Swerve. Sorry to hear that. What happened? Did you make any substitutions? Just made this tonight. I omitted the butter and used a little extra cream. I added an extra tsp of cocoa. I used liquid stevia because that’s what I had on hand. The texture turned out wonderfully creamy, and the flavor very good, but it was a little too bitter for me even though I added the pinch of salt that someone recommended. (Maybe it was my liquid stevia that caused the bitterness?) I was trying to think what I could add to counteract this and I saw the sour cream. I know that sounds weird, but I folded in 1&1/2 TBSP and it took down the bitterness and almost gave it a hint of chocolate creme fresh. Very, very good! Thanks for sharing your modification Chris! I am glad it turned out well in the end. Granulated sweetener tends to work better in this recipe than drops, but very interesting about sour cream taking away the bitterness! Hi. The bitterness may come from the extra cacao. Hi Sue, I think there was someone on Google+ who used to add whipped egg whites to boost the protein content. I think it should work fine in terms of texture. This recipe was amazing. I didn’t have artificial sweetener so I took one of the suggestions to add coconut oil and another to add vanilla and a little less than a pinch of salt. I’m really impressed by the response of the author. Thank you for your kind words James! I am so glad you enjoyed the recipe. Thanks for sharing your tips. Hmmm, This sounded so yummy, but for me personally, it had too much of a buttery taste, and not enough chocolate…Don’t get me wrong, I will definitely make it again, just using a little less butter, a little more chocolate, and a little more whip cream (to even out the loss of butter! Hi Peggy, I had several comments like yours from people who found it a bit too buttery. You can definitely sub with more whipped cream or more cream cheese instead, so I hope it turns out more to your liking next time. it may be a good idea to add extra vanilla in the original recipe. In my baking I generally double the amount of vanilla in recipe and i get wonderful results. Agree – vanilla is a great flavour. I am definitely going to try this. I may put a bit less sweetener and add a couple drops of Stevia toffee sweetener. I love toffee! Ooh – I like your thinking! I love toffee too so thanks for the tip! Can i ask is there any reason i cant use unsweetened bakers dark chocolate. I have all the needed ingredients except no cocoa powder just the bakers. You could use unsweetened chocolate. The only thing I am not sure about is the best way to mix it in. Cocoa powder can just be stirred in. I suppose you could grate the chocolate. Or melt it over a Bain Marie with some of the cream, cool completely, and stir it in. Can you tell me what the total carb count is? My husband is diabetic and we have to use total carbs. He can adjust his other intake or portion size if needed. Looks great – can’t wait to try it! Hi Susan, total carb count is 2g per portion, 6g for the whole mixture. I hope you both enjoy it! I made this about a year ago & remember thinking that it tasted a bit buttery. 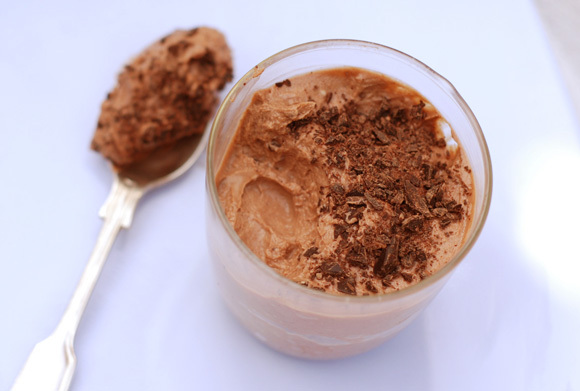 Now I’m coming back to it b/c it’s sooo much better than the other low carb mousse I make. I used swerve sweetener, it was a little grainy which i actually don’t mind. I used 1.5 tbs because i wanted it a bit sweeter. maybe after it sits in the fridge for a day it will smooth out. i love that you can eat a tiny bit and it’s enough. it made such a small amount and i thought ha, right, 3 servings, i can eat the whole batch in 3 bites. but i could barely finish 1 serving it was so rich and definitely satisfied my sweet tooth. a little goes a long way. Thanks for your comment, Jilly! Yes, indeed, it doesn’t look like much when you first make it. I am so glad you liked it. Wow – a great modification to the recipe! Thanks for sharing! Thank you for the recipe! I wanted to use less butter so I did half butter and half coconut oil, and it is very tasty. Brilliant, thanks for sharing the tip! I made this the other night and loved it! Tonight I made it again, but added almond milk and turned into a shake. This was AMAZING!! Thank you so much for sharing. I added a little more cocoa when I made this, because of a few comments I read. This was just what I needed to help with my sweet cravings!! Great, I am so glad you liked it! I just made this. It was great! I loved the mouthfeel – it was such a treat. I divided the recipe into 2 cups and it was a good portion. I used 1 T and 1 t of cocoa, a dash of salt, vanilla, and I sweeteened it with 1 T of erithritol and some drops of stevia. I enjoyed it with some Dr. Brown’s diet black cherry soda which really complemented the mousse. Thank you. Fantastic – really hit the spot! Thank you! Thanks Janelle, I am so glad you liked it. How many calories per serving ? This was wonderful. It was hard not to eat the whole thing! Thank you for sharing this! Thank you, that’s great to know! The Truvia Baking Blend does have sugar in it. Only the smaller packet sizes are erythritol and glycerine. Be careful with Truvia. I believe it contains dextrose or malto-dextrin. It might have 1gm of carb in it but that can add up if you are using it throughout the day. Hi Rick, Truvia sweeteners are made from a mix of Stevia extract and erythritol – no dextrose or maltodextrin, and 0 net carbs. The only exception is Truvia Baking Blend, which does actually contain sugar. PERFECT! Made it exactly as the recipe states. Loved it! How many ounces are in a serving of this mousse? Hi, it would be about 2.7 ounces, assuming three servings are made. I know this doesn’t sound like a lot, but the mousse is very filling, so you don’t need much. This recipe is ALL wrong! One tablespoon of cocoa powder is not enough. It’s a shame that it ranks so high on the search engine. The recipe is really awful! We all have different tastes Diane. For many people, 1 tbsp of cocoa is enough in this recipe. It’s upsetting to receive comments as negative as yours but, oh well, you can’t please everyone. You are entitled to your opinion, and people who like this recipe are entitled to theirs. Best of luck with your diet anyway. Yes, the negativity is uncalled for…I’m one who likes less of a chocolate flavor, so I will only add 1tsp of pure cocoa…and I knee it will be ALL right for my taste buds!!! Thanks fire sharing and can’t wait to try it later!!! I made this last night and I really enjoyed it! It was a quick, easy way to have a homemade chocolate dessert and I will definitely be making it again. If you didn’t care for it, Diane, then don’t make it again, but obviously many people have enjoyed it. Good recipe. Lovely texture, nice taste, just a little weak on the chocolate front for me, will try adding some melted Green & Blacks 85% chocolate added to the butter up front next time. There will definitely a next time. Also didn’t bother whipping the cream (lazy), just beat it into directly the mix with a spoon and it was still pretty light. Great idea about melted chocolate, many thanks for sharing! Whip your cream first and you won’t even need to clean the beaters (that you pre-chilled in the freezer with the bowl). I thought it needed a little more chocolate so I added a gently heaping teaspoon more cocoa. I used powdered erythritol and it took another level teaspoon for my tastes, and still wasn’t too sweet. If your tooth is sweeter than mine, you could probably go 2 tablespoons. Chillin’ in the fridge for dessert tonight, thanks! Tasted like butter, not pleasant at all. Hi guys, I guess we all have different tastes. Thank you for taking the time to share your feedback. I will update the page to make a note that some people don’t like the butter in this. Maybe you whipped the cream too long. I couldn’t taste any butter at all. With like 100 good reviews and then yours, you don’t suppose it’s just you, eh? I don’t whip cream very often. How long are you supposed to whip it? I could taste the butter, too, and I know I wasn’t quite sure how long I was supposed to beat the cream – and, no, I did not freeze the bowl and beaters first because I didn’t know better. 🙂 Thanks! I made this tonight. I am still trying out artificial sweeteners. I used a powdered stevia. That, combined with the cocoa powder left a bitter aftertaste. I understand that’s common with these sweeteners, thought. Otherwise, it was creamy and fluffy and pretty good. I think it could benefit greatly from a touch of vanilla extract. Thanks for your feedback! Indeed sometimes sweeteners can have a bitter aftertaste. I tend to use mix of stevia and erythritol, such as Truvia or Swerve, they tend to be a bit better in that respect than pure stevia. Good idea about vanilla extract! I made this last night, I added some vanilla extract and found that it was really good! It definitely hit the spot in terms of my sugar craving. I thought it was really good, I didn’t really taste an overly buttery flavor either. A little bit of salt will help cut down on bitter flavors. Tried it first w cocoa but didn’t care for it, so today I made it again with fresh vanilla bean, extra cream cheese, and a bit of salt and it is amazing. Tastes like creme brulee. Thanks, I am glad it worked out in the end. I bet I would prefer this! I’m more of a vanilla fan. I made the chocolate one and it was slightly “sharp” for my tastes . 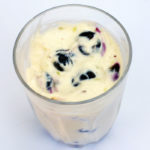 Hi Taracu, there is a version of this recipe made with vanilla: https://www.carbophobic.com/vanilla-keto-mousse/ You could just skip the blueberries if you don’t like them. It turned out good except needed more splenda. Thanks for letting us know Jenn. Everyone’s taste is different, so of course some people might prefer to add more sweetener – or more cacao. As long as it comes out the way you like it! OMG, finally a keto dessert that is not coconut! yes. thank you, thank you, thank you! I made this last night, used stevia drops, added a small bit of peanut butter and a shot of espresso. Came out awesome! ( even before my additions). Thanks for the recipe. Making our keto week friendlier. .
My mouse split and went watery, what did I do wrong? Hi Teresa, sorry to hear it didn’t turn out well. Did you make any substitutions? My mouse also split and went watery, and I dont understand why. I used Sucaryl (Saccharin) liquid sweetener instead, about 15 drops. Unsure if it was that, or something else. It seemed to split after I added in the whipped cream. I dont understand what went wrong. Hi James, there are multiple reasons why a mousse might split, it’s quite hard to tell. I would recommend using a granulated sweetener instead of sweetener drops. Have you made any other substitutions? This was so good! I used 6 packets of Splenda which was less than a tablespoon but it was plenty sweet. I’ll probably use 5 next time. Thanks for a recipe with no coconut oil! They look absolutely scrumptious! Do you think they’ll freeze well? That way I can make them way in advance and just take one out on days I know I’m going to need that chocolate kick. Thank you for the delicious recipes! It actually freezes really well. It doesn’t get as firm as ice cream, but has a great consistency and definitely knocks out a sweet tooth! Great, many thanks for letting us know. I was wondering this also.. freeze them in small candy silicone tray and pop one in once in awhile.. yum.. thanks! Hi Klaire! The recipe makes 3 servings – so if you quadrupled the quantities listed, then you will have 12 servings in total 🙂 One serving should weigh about 75 grams (2.5oz). This might not seem like a lot but it is very filling, due to the high fat content. You can also quickly soften butter and cream cheese by putting them in a zipper baggie and immersing it in very warm water. Great idea! Thanks for sharing, I will update the post to include this option! Eating this now….super good stuff! Thank you! Thank you for letting me know Stacy, I am so glad you liked it 🙂 Good news about coconut milk too, I will update the recipe to include this option.